Open-beak Storks and Swamp Fowl share a swampy domain. Je reconnaît la poule d'eau avec son bec rouge. Ray: Les volailles des marais sont communes à de nombreuses parties du monde, Martine, elles peuvent même être en France. Or words to that effect..
Ray: Swamp Fowl tend to be anti-social, Chris, so I was surprised to see them together and among the Storks. Red beaks and red legs like our storks. I like the name open- beak storks. Ray: I like that name, too, Philine. Rich pickings for all, I should think. Ray: The birds seemed quite at ease in this swampy area, Alan...there were thousands of storks and egrets off in the distance. the leggy storks do hold my attention, Ray. Ray: Very pleasant birds, Ayush, and useful to us rice farmers as they feed on the snails that feed on our young rice plants. All friends together it seems. Ray: All seemed harmonious, Brian. 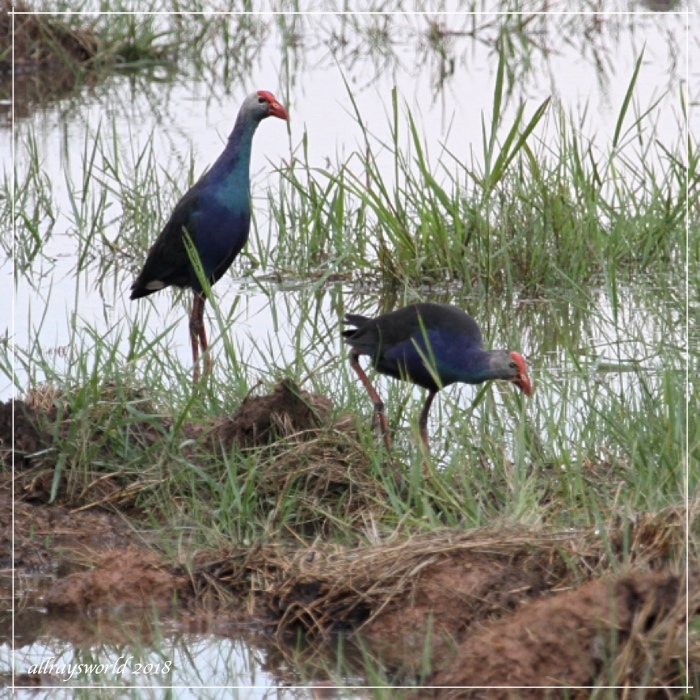 The swamp fowl look interesting with their seeming iridescence and bright face marking. Ray: Swamp Fowl are lovely birds, but are usually extremely solitary and human-shy, Mary. I believe we have the same species in Australia. Ray: Thank you, Tom...from a short visit to a nearby Bird Sanctuary. Those are some interesting looking birds! Ray: Swamp Fowl are lovely birds, Elizabeth.